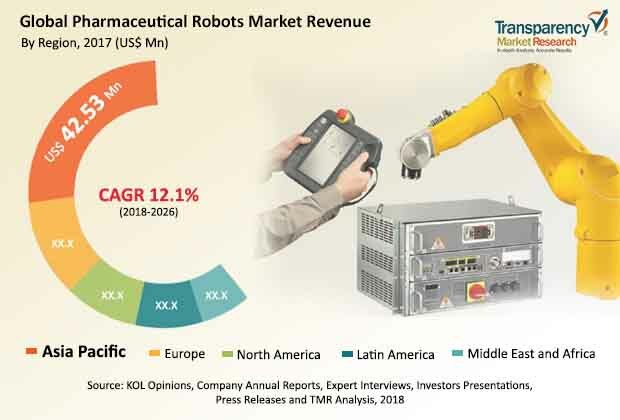 The global pharmaceutical robots market is predicted in a report by Transparency Market Research (TMR) to witness high adoption of regional expansion, new product development, and merger and acquisition as key business strategies. This could be evidenced by the addition of three new regional training centers, relocation of three facilities, and opening of four new facilities of FANUC America Corporation in 2016. In the following year, Universal Robots opened its own academy to raise awareness about automation by offering free online training in robot programming. There are also other companies, viz. Yaskawa Electric Corporation, ABB Ltd., and Kawasaki Heavy Industries, Ltd. looking to secure a position of strength in the market. TMR envisages the global pharmaceutical robots market to post a 12.1% CAGR during the forecast period 2018-2026 to be worth a US$250.46 mn by the end of 2026. In 2017, the market held a valuation of US$92.73 mn. Amongst end users, pharmaceutical companies could secure a lion’s share as their market expands at a CAGR of 12.8%. Regionally, Asia Pacific is prognosticated to take the driver’s seat of the market, considering its US$42.53 mn valuation secured in 2017. Growing awareness about various advantages offered by pharmaceutical robots with their outstanding properties and capabilities is expected to push the growth of the market. For instance, pharmaceutical robots can perform tasks more adeptly than humans. Unlike humans, they could operate in risky settings with biological dangers such as the threat of toxic chemotherapy compounds and radioactive contamination. Scientific research is one application that could bring in highly lucrative market opportunities for vendors. Pharmaceutical robots could also be used in blood sample testing, pharmaceutical and medical device manufacturing, and drug discovery. The market could rake in a whole lot of revenue with rising awareness about robotic machines. The global pharmaceutical robots market is prophesied to face with the challenge of lack of skilled personnel in automated manufacturing units. High cost of robots could be another factor looming over the market as a threat to its demand. However, the introduction of cost-effective solutions is envisioned to create rewarding business prospects in the market. On the other hand, massive reduction in production cost, increasing technological developments, and swelling demand from the pharmaceutical industry could help the market to increase demand in the coming years. Pharmaceutical laboratories are using robots on a large scale to inspect and pack drugs. New developments in collaborative robots is anticipated to set the tone for valuable growth in the global pharmaceutical robots market. Their easy maintenance and cost-effective nature could further increase market growth during the course of the forecast period.